Yesterday we had another snowstorm that dumped a foot of snow upon us. Fortunately, we could stay home and watch it from our windows and didn’t have to drive anywhere. It was accompanied by a bitterly cold wind that made it less than pleasant to be outside. However, the dog needs walking and snow must be removed from the driveway, walks and deck, so out we went as the temperature dropped at the end of the day. 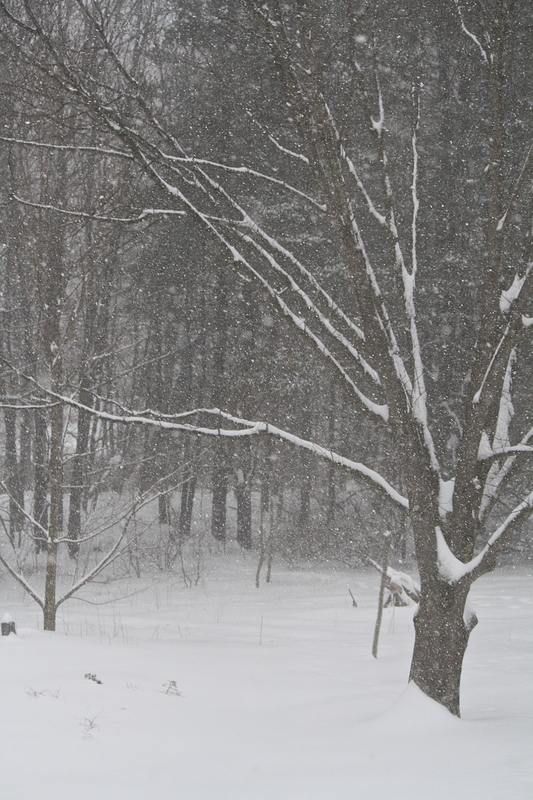 Wren, our new dog, loves the snow and cavorts like a puppy, bounding through the drifts. Being only a year or so old, she has lots of energy! While I shovel and my spouse uses the snowblower to clear the blessedly dry and light mounds of the white stuff, Wren barks enthusiastically and digs feverishly through the snow searching for the voles and mice she undoubtedly smells. The bird feeders were very busy all day and today as well as the temperature hovers in the mid-teens and with the windchill feels like the negative teens. You’ll have to forgive the fact that my photos today understandably are taken from inside the house! 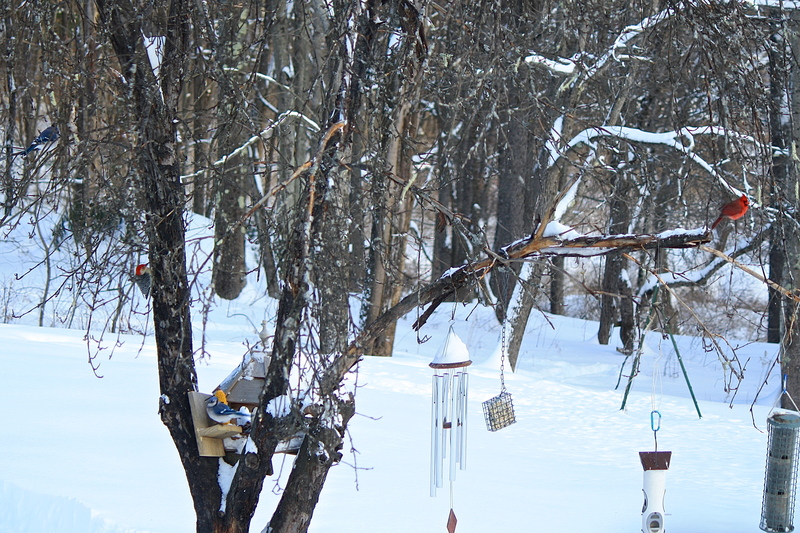 Color in winter~I spy two bluejays, bright yellow corncob, red-bellied woodpecker and a cardinal! 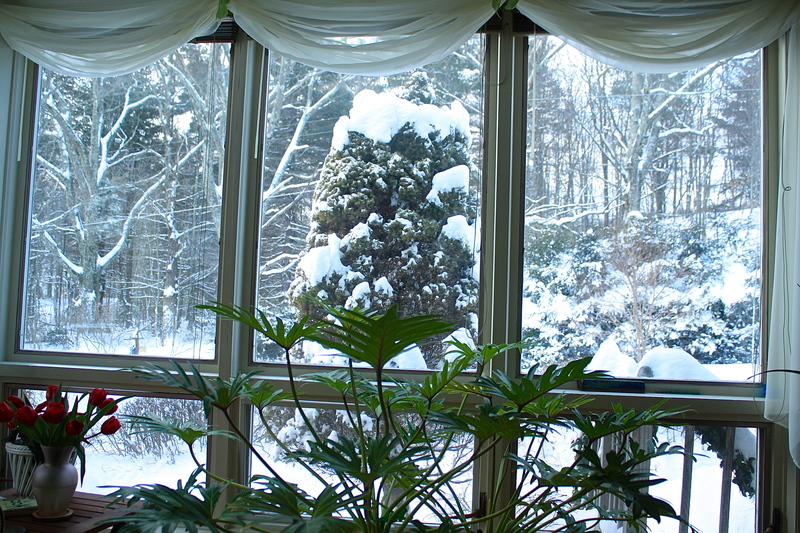 I will go out later to snowshoe the trails, but I’m not keen on taking the camera out there despite the beauty that awaits capture. I will absorb it into my memory instead. 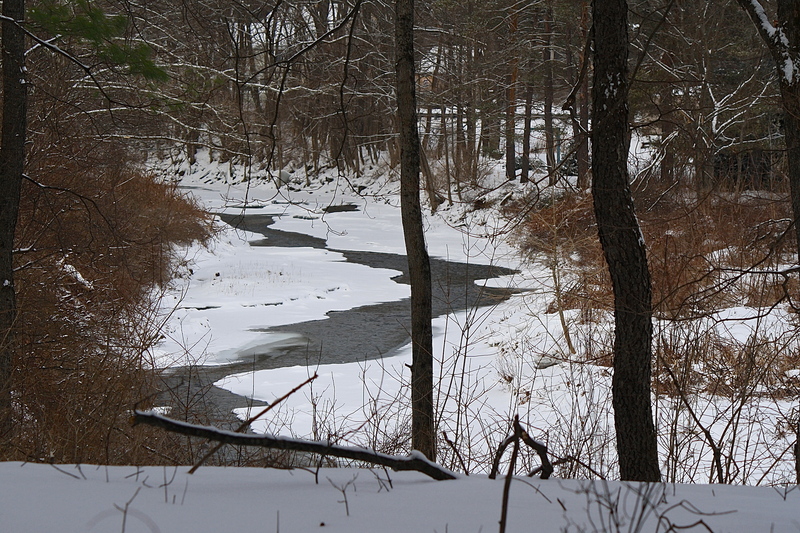 The larger tree branches are outlined in white, the evergreens are heavily frosted with drifted snow and the river looks black against the smooth sculpted curves of snow that soften its edges. Truly a winter wonderland, and despite the beastly cold wind, a lovely place to be. This entry was posted in Country Living, Field Notes, My Photos and tagged cold, dog, frigid temperatures, nature photography, photography, shoveling, snow, snowblower, snowfall, snowstorm, winter. Bookmark the permalink. Oh, dear, watch what you wish for – that would be a big storm! Nope… it would only take six inches and I’d be stuck 🙂 The village roads wouldn’t let me out 🙂 And Ani would love it. 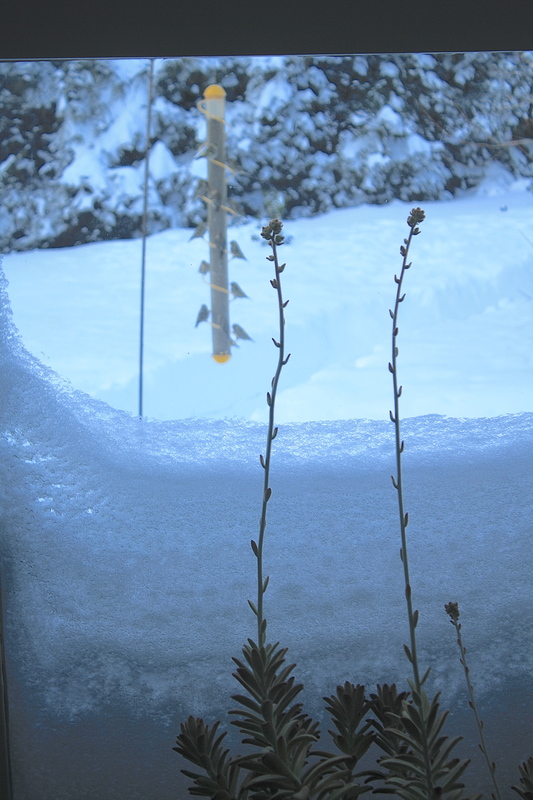 Not likely though… we seldom get much snow here. 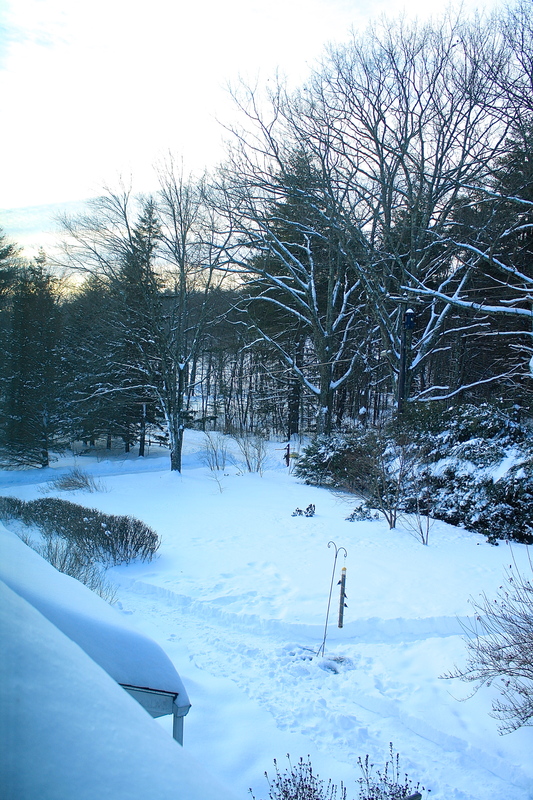 If we had stayed in Massachusetts, we had planned to take up snowshoeing or cross-country skiing. I’d love to know more about how you learned to snowshoe. The wind yesterday in Virginia was fierce but not the temperatures. So I can only imagine how the combination of the two must have felt up there. Pictures from inside forgiven!! The key to shoeing is getting the proper size – too large and the gait won’t be right. Other than that, you just strap them on and go. First one to break the trail works the hardest, after that it is a breeze. Breaking trail is quite the workout! I wonder if it would register on a fitbit. Not that I’m obsessed, mind you. No, seriously, I can imagine you get an excellent workout and earn the right to a nice hot cup of cocoa after breaking the trail. Winter doesn’t have to be a massive case of cabin fever if you’re properly outfitted, I see. Absolutely. I would go nuts and physically downhill if I didn’t exercise daily. Even a quick walk clears the mind and works the kinks out. Warm gear is the critical piece, however. I don’t know why- but this almost brought tears to my eyes. Such a winter wonderland. Perhaps it is the love I sense from you towards it? Aw, sweet comment, Kim. Yes, I do love it! What beautiful scenery! I especially like the first photo. I could get lost looking into it. It’s funny to hear that Wren loves frolicking in the snow. When it gets into the low 50’s my dog Phoebe just stands in the open door but won’t go out. And if it is raining out, she’s adamant that she WILL NOT GO out there. Thanks for sharing so many pictures. My pleasure to share. I think of my warm climate friends and want to show them what they’re missing! 😉 maybe not! 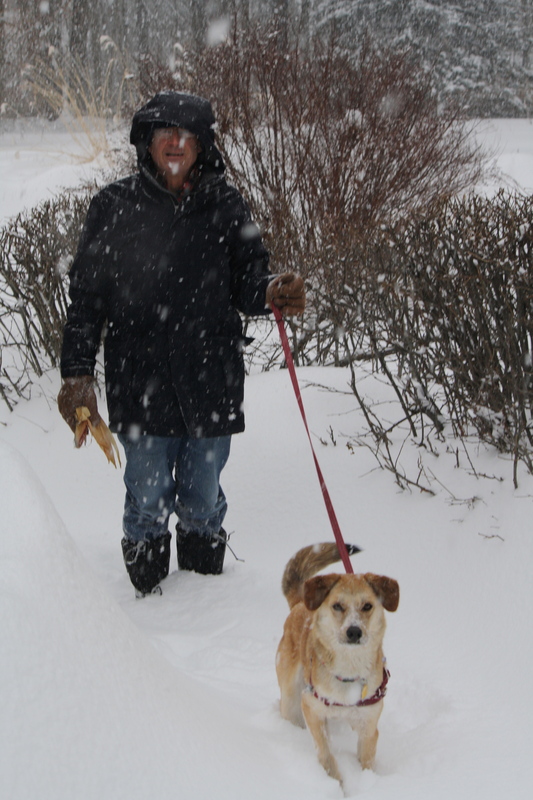 Funny about Phoebe – I thought dogs were impervious to the weather. Maybe its because the weather seldom varies out there. What an amazing world we live in. After months of humidity and heat I woke to a pleasantly cool autumnal morning thanks to a cyclone out near Fiji, and you have the depths of Winter and another of your readers is flaunting Spring! As Louis Armstrong used to sing WHAT A WONDERFUL WORLD!! Thanks so much, Julie. I loved seeing all those pretty birds there at once. Thanks, dear Trini! You must miss winter sports like sledding or skiing. I mostly miss building things in the snow and making snow angels. I am very bad at sports, any sport. Smiles are from seeing the beauty of the seasons. You’ve caught the feeling of winter in your photos Eliza. And I love it that the pup looks so happy to be out and challenging life’s newest surprise. Thank you kindly, Dor. Yes, Wren is a happy girl! Looks beautiful to me, Eliza. I LOVE winter. Love the snow and the cold and the extra effort it takes to do even the simplest thing. How could we ever appreciate Spring if we didn’t go through what we had to in Winter? Love the Peace of the Winter season. Lovely pictures. Thanks, Val. I am so grateful to see the birds in winter – life despite the cold! That little red-bellied woodpecker is glorious, isn’t he? Such a lovely spot of colour amidst the winter landscape. I love the winter birds – they keep me going until spring arrives. Wonderful photos… I enjoy seeing pictures of the snow but living in Southern California I don’t actually want to be living in it! Armchair traveling is wonderfully convenient and you get to sleep in your own bed every night! 😉 Thanks for stopping by – your comments are appreciated! That’s a lot of snow! Lucky you! Nice shots. pretty snow! We got some last weekend + I had to shovel off the top to help my husband get through with the snow blower:-) It was thick and wet but the next day snow was fluffy and white! Thanks, Robbie. Shoveling is good exercise and gets us out of the house and into the fresh air. I, too, love seeing that spot of red cardinal in all that white – so beautiful, lifts the spirit. + in your photos always an extra bonus for you are an artist! Such kind praise, thank you! Getting a snow fix through your wonderful photos. 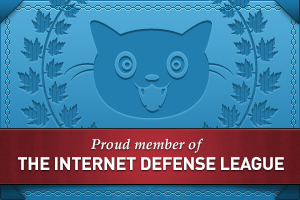 Glad to serve as a portal. 🙂 Thanks for your visit!